Some students went home for spring break, while others traveled somewhere warm. But the USD Chamber Singers took a trip across the Atlantic and spent their break touring Europe. Every spring, the Chamber Singers go on a tour. Last year, they traveled throughout the Midwest, but this year, they took their music all the way to England and France and performed five concerts. 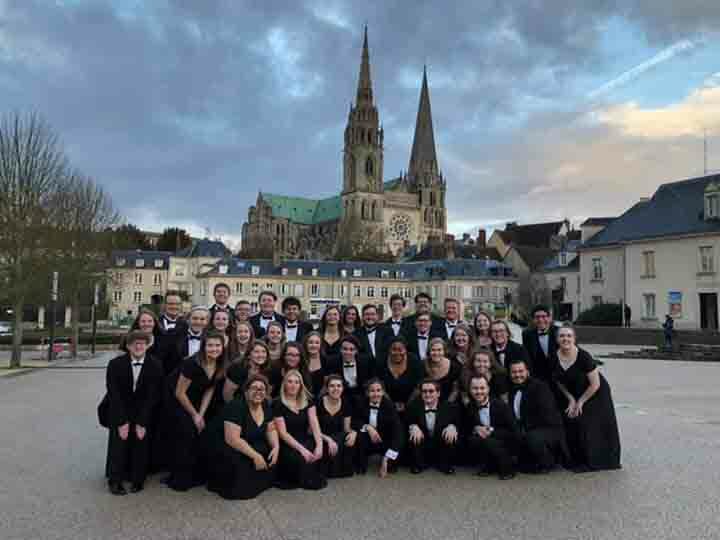 Junior music education major Dominick McClendon has been a part of Chamber Singers for the last two years, and this was his first time visiting Europe. Junior vocal performance major Bailey Quade has been in Chamber Singers since her freshman year. This was not her first time in Europe, but it was her first time visiting England and France. The Chamber Singers start preparing their music set at the beginning of the school year and build on it until the tour. While they’re used to performing in auditoriums and concert halls, their concerts were all in cathedrals and churches. McClendon said he enjoyed performing in these spaces because of the amount of history and reverence within them. McClendon said bonding with the group as they blended thier voices abroad is something he won’t forget.